getWaiter! makes sure dining out, getting brunch, more drinks or just moving the umbrella into the sun more relaxing and enjoyable. The business is at the top level. There is one business per getWaiter account. The business may or may not have a site (see below) associated with it, if the business consists of only one site then the business may be the site address, if the business has many sites then the business details may be for the head office. The site are the at the next level. A site can be considered an address, for example, you may have hotels in London, New York Los Angeles and Milton Keynes, these would count as four sites. 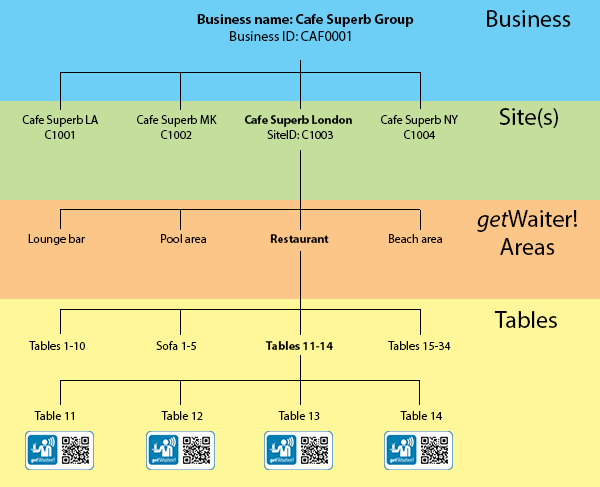 Each site may consist of one or more distinct areas, a getWaiter area is any area that has it's own group of waiters and do not overlap. For example a hotel may have a lounge bar, a pool area, a beach area and a restaurant, this would be four getWaiter areas and each would have at least one waiter station. Within each getWaiter area will be a number of places where people want service, these may be tables, sofas, loungers. Each of these need to be uniquely identified so the getWaiter system knows where your clients are. Each position will have a getWaiter code. These codes can be printed yourself from the website or a range of pre-printed tableware is available from the online store.